Our firearms safety courses in IL start with home defense and first time gun owner training and how to clear and search your home safely. If for any reason you have any questions or comments about a firearms safety course in IL, feel free to give us a call at 815-433-2471 or fill out the form to the right and a representative will respond shortly. Our firearms safety course in IL is designed to expand a student’s skillset and technique to handle increasingly stressful situations. Our firearms safety course in IL has a range in difficulty and we highly suggest you follow our recommendations based on your experience. Our Vehicle Defense firearms safety course in IL is an advanced level class not for first timers. You will need to know and be able to demonstrate safe gun handling, weapon system familiarity, and basic marksmanship skills. Heavy emphasis is placed on critical thinking and problem solving under high stress situations in our firearms safety course in IL. Our instructors will be adding scenarios which will make you think outside the box. Each class offers unique insight into how to approach a situation with a firearm while keeping yourself and others as safe as possible. 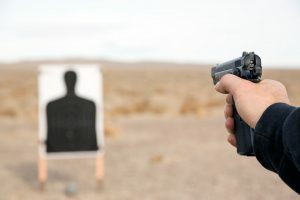 Our firearms safety course in IL is considerably more affordable compared to other ranges and our approach to training is to offer shooters the opportunity and experience to improve their skill set and handling of firearms. At Buffalo Range Shooting Park, SAFETY comes first. If for any reason you have any questions or comments about our firearms safety course in IL, feel free to fill out the form to the right and an associate will respond shortly or give us a call at 815-433-2471.